Fanless design is becoming an essential requirement for critical environments. 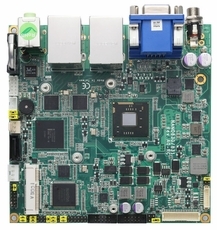 Considering the booming demands of fanless operation and low-power design, the NANO831 utilizes the low power Intel Atom dual core processor N2600 1.6 GHz, and is designed to operate at a very low-power consumption as well as limited space. One DDR3 SO-DIMM on board implements up to 2 GB of system memory. Through an integrated Intel Graphics Media Accelerator 3600 featuring DX9 and OGL 3.0 support, the NANO831 comes with VGA port and 24-bit dual channels LVDS interface with dual-view supported.